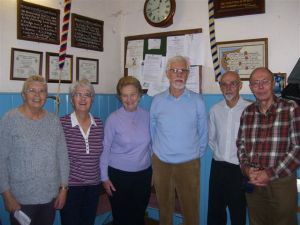 Bell-ringers at St Peter’s Church Titchfield. Bells: 6; tenor 12 cwt. We are an active band, ringing rounds to Surprise Minor. Visitors of any standard, from beginners upwards, are always welcome. We are currently looking for more people to join us. Have you learnt to ring but have not done so for a while? Why not come & meet us and refresh your skill? Would you like to find out more about bell ringing and learn a new skill? Then come and have a try! We ring for Weddings (a fee applies) and we are willing to ring a quarter peal (taking about 45 minutes) for special occasions such as Weddings and Anniversaries and to mark village events.